Twitter/@SCEMD(HORRY, S.C.) -- Florence flooding is far from over. Ten days after the deadly hurricane hit, rivers are continuing to crest and some South Carolina residents are preparing to evacuate. In Horry County, South Carolina, flooding is expected to reach or exceed levels from Hurricane Matthew in 2016, Horry County police said Monday. The Waccamaw River in Horry County crested at a record level of 20.22 feet this weekend, more than 2 feet higher than during Hurricane Floyd in 1999 and more than 3 feet higher than it did two years ago for Matthew. Horry County officials anticipate about 21,000 people could be displaced by the flooding, county spokeswoman Kelly Moore told ABC News Sunday. Evacuations aren't mandatory but shelters are available for those who choose to leave, according to police. 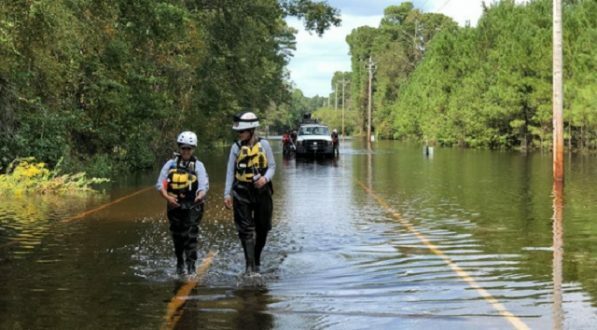 "Our officers are out across the county, checking roadways for flooding and educating communities that may be at risk," the Horry County Police Department said Monday. "If you feel that you may be in danger, do not wait too late to evacuate. But, if you do, we'll do our best to rescue you, even when it means putting our own lives at risk." Flooding is also threatening Georgetown County, South Carolina. Roads may be impassable in Horry and Georgetown counties this week, with over 150 roads already closed across the state, South Carolina Emergency Management Division said Monday. Additional law enforcement resources have been sent to both counties, the emergency management division said. "Be prepared to leave your home if told to do so by local public safety officials, but you do not need to wait to be told to evacuate if you feel unsafe," the emergency management division said Monday. At least 43 people, including several young children, have died from Florence, which brought unprecedented rainfall and flooding to North and South Carolina when it hit Sept. 14. "We have never seen one like this," North Carolina Gov. Roy Cooper said last week. "This one has been epic, it has been disastrous and it has been widespread." President Donald Trump visited the devastated region last week, calling Florence "one of the most powerful and devastating storms ever to hit our country." As the states look toward recovery, Trump pledged that the federal government will "do whatever we have to do to make this perfect."